South Jersey vineyard and winery managers are invited to an Alert Meeting at Auburn Road Vineyard and Winery, 117 Sharptown-Pilesgrove Road, Woodstown, NJ on Monday September 29th at 4:30 PM to 6:30 PM. Do you have plants that look like this? It may be a virus symptom. 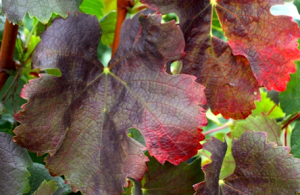 We often see red leaves in vineyards at this time of the season, which can result from many causes including viruses, mineral deficiencies, trunk injury, and crown gall. In a season like 2014, following a damaging winter, the most common causes include the aftereffects of cold injury to the woody parts of the vines and the subsequent crown gall infections. There are several well-documented types of viruses known to have serious deleterious effects on the performance of grape vines with names like Grape Leaf Roll and Grape Fan Leaf. A newly identified virus, generally called Red Blotch, is present in New Jersey vineyards. Red Blotch biology and potential impact on vineyard performance is yet to be worked out. Vineyard Tour with identification of disease symptoms. Dan Ward, Specialist in Fruit, will lead a discussion of how we best address the problem of virus impacts on our wine industry. Brad Hillman, Plant Virologist and NJAES Associate Research Dean, will present a strategy for learning about a new virus so that we can make rational cultural decisions. His integrative approach to understanding the biology of viruses and their management in agro-ecosystems will be informative. Ann Nielsen, Specialist in Fruit Entomology, and Dean Polk, Extension IPM coordinator, are conducting a statewide survey of grape pests, including viruses and will discuss the need for participation to make it effective. Peter Oudemans, Specialist in Fruit Pathology, has experience with the impact of viral diseases in perennial fruit crops. His insights into disease management strategies will improve understanding.